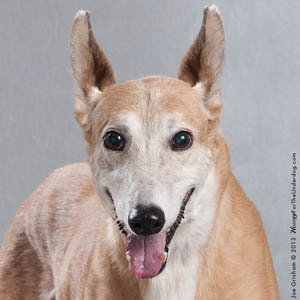 Babe, aka Foxy Brown Babe, is a 13-year-old red fawn female born June 1, 2000. Her sire is Oswald Cobblepot and her dam is Frans Rudy. Babe has 30 races to her credit, all at the Raynham/Tanton track in Florida. Her career started on September 5, 2002 and ended on November 10, 2003. 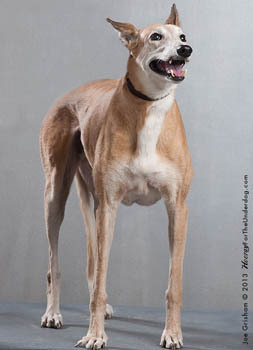 She has been at a greyhound breeding farm since then, but was not bred. This sweetheart just wants a soft bed, and a loving family. Babe is cat and small dog tolerant. Babe had a sudden stroke and left us for the Rainbow Bridge at age 13, and on the brink of being adopted by a wonderful mom. A moment of silence for Babe, please. Before I start telling you about Babe, I need to look around furtively to make sure she's not listening. OK, she's asleep on the futon, so I can make this request: Please don't let her know she'll turn 13 in June. True, she has only four teeth, most of which can be seen even if her mouth is closed. And yes, she may wander into a room or outside and forget for a brief moment why she's there. But who among us doesn't do that? 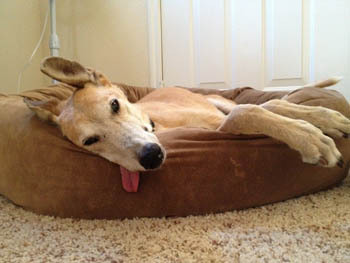 OK, she sleeps most of the day, but rare is the greyhound of any age who doesn't need a decent amount of shut-eye. Babe rarely (as in never) gets riled. She's easy-going. She eats heartily -- yes, even with four teeth. Though she isn't exactly clamoring for walks, at times when a foster sibling is making the block rounds, she barks a bit. But a big hug, calm voice and perhaps a soft treat tends to settle her down. What doesn't settle her down -- and who can blame her? -- is being around a youngster. When foster sis Angie goes outside, Babe is usually right behind her. Babe wags her tail and jumps a little, making no attempt to mask her mirth at being in the company of such a youthful friend. When a young male visited the house, Babe left the room she hardly ever leaves (except to go outside) and wouldn't let him out of her sight. She smiled and she flirted and that is the honest truth. Babe would do best with another dog, preferably one at least a few years her junior. 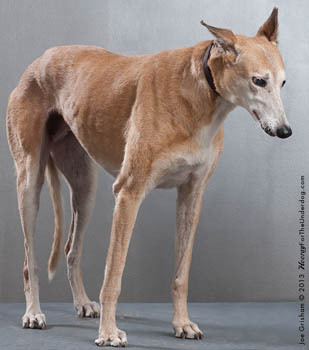 She relies on Angie to remind her which direction to head to the yard, to enliven her day, to keep her company. Babe is also fine with our cats, paying them no mind. Babe is, yeah, a babe. A charming, unassuming and, when the mood strikes, frolicking kinda gal.